His father played drums and piano and his mother the piano and he refers to the early influence of hearing jazz, especially that of big bands, on the radio. His main influence was Philly Joe Jones and he was mentored by Papa Jo Jones. Hayes led a band in Detroit as a teenager and worked with Yusef Lateef and Curtis Fuller from 1955-1956. His three most notable associations are Horace Silver's Quintet (1956-1959), the Cannonball Adderley Quintet (1959-1965), and the Oscar Peterson Trio (1965-1967). Hayes often teamed up with Sam Jones, both with Adderley and Peterson, and in freelance settings. Louis Hayes led a group at clubs in Detroit before he was 16. He moved to New York in August 1956 to replace Art Taylor in the Horace Silver Quintet and in 1959 joined the Cannonball Adderley Quintet, with which he remained until mid-1965, when he succeeded Ed Thigpen in the Oscar Peterson Trio. He left Peterson in 1967 and formed a series of groups, which he led alone or with others; among his sidemen were Freddie Hubbard, Joe Henderson, Kenny Barron, and James Spaulding. He returned to Peterson in 1971. The Louis Hayes Sextet, which he formed in 1972, became in 1975 the Louis Hayes-Junior Cook Quintet and the Woody Shaw-Louis Hayes Quintet (Cook remained as a sideman until Rene McLean joined); in its last form the quintet played successful engagements throughout Europe and (without McLean) acted as the host group when, in 1976, Dexter Gordon visited the U.S. for the first time in many years. After Shaw left the group in 1977, Hayes continued to lead it as a hard-bop quintet. From the 1970s onward, he led a variety of groups including a quintet co-led by Junior Cook and Woody Shaw. Louis Hayes has appeared on many records throughout the years, and played with John Coltrane, Kenny Burrell, Freddie Hubbard, Bobby Timmons, Hank Mobley, Booker Little, Tommy Flanagan, Cecil Taylor, McCoy Tyner, Ray Brown, Joe Henderson, Gary Bartz, Tony Williams and Dexter Gordon. He also led sessions for Vee-Jay (1960), Timeless (1976), Muse (1977), Candid (1989), Steeplechase (1989-1994), and TCB (2000-2002). Today he mentors young jazz artists, and continues to perform with a variety of other musicians both old and young. He was with McCoy Tyner's trio for over three years. 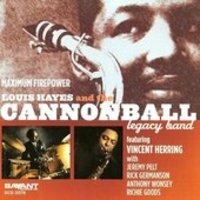 Since 1989 he has led his own band, and together with Vincent Herring formed the Cannonball Legacy Band.